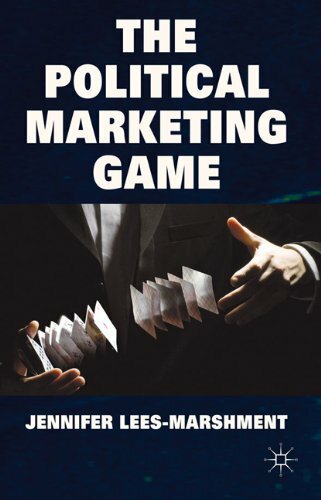 I’ve recently reviewed The Political Marketing Game by Jennifer Lees-Marshment for Progress Magazine (I’ll post the review here once the article’s published) and the author – undoubtedly one of the foremost academic writers on political marketing in the world – has kindly agreed to answer a few questions. 1. Is political marketing an inevitable aspect of politics? Yes – but because political marketing offers modern insights to the age old question as to how political elites listen, respond to and deliver for the public. Whilst old fashioned methods such as persusion, or class indications of voting, once worked to help politicians get elected, this is no longer true. Just like businesses politics needs to use marketing methods to understand and increasingly diverse and unpredictable electorate. Market research and segmentation offer new tools to do this. However it is not easy to satisfy market demands – and politicians are now realising the voters want a more nuanced and reflective leader who will consider the realities, constraints and long-term needs of the country, rather than just public wants identified by focus groups. In this case, politicians also need conceptual tools such as branding helto help develop not just a product but a sense of direction and vision; and more mature conversational market research tools such as co-creation and deliberation. So yes, it is inevitable, but it is not easy. 2. What’s your favourite piece of political advertising? The posters or credit cards used by UK Labour in the 1997 election to advertise their pledges. The reason is this highlighted a trend to political marketing which emphasised delivery. They crystalised what the party was about policy wise, but also how they were interested in achievement not just rhetoric. If politicians focus on delivery, then they actually worry about getting things done. Whilst the detail of those pledges, and public service targets generally, might be debated and critiqued, the spirit was right – to make politics about changing and delivering, which holds the potential to create longer-term trust between politicians and the public. 3. If you could give one piece of advice on political communication, what would it be? Make it positive. Whilst negative attack on competitors gets attention, it reduces voters’ ability to believe in you. Say what you are going to do to make things better for them or the country. I think the negativity is what lost the Conservatives support in 2010 – people though well if everything is so bad economically, how will the Conservatives make a difference? Despite the important of political marketing, and the need to research voters’ views, politics still comes down to being focused on changing the world for the better. Negative political communication cannot do that.